Marcus Aurelius Severus Antoninus Augustus, was Roman emperor from AD 198 to 217. He was the eldest son of Septimius Severus and Julia Domna, and reigned jointly with his father from 198 until Severus' death in 211. 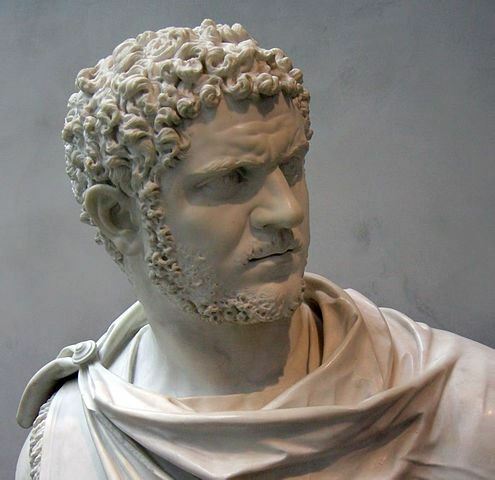 Caracalla then ruled jointly with his younger brother Geta, until he had Geta murdered later that year. Caracalla's reign was marked by domestic instability and external invasions from the Germanic people, and by the Edict of Caracalla which granted Roman citizenship to nearly all freemen throughout the Roman Empire. Caracalla is presented in ancient sources as a tyrant and cruel leader, an image that has survived into modernity. He is especially remembered for the massacres he enacted against the people of Rome and elsewhere in the empire. Obverse: ANTΩNINOC AVΓOVCTOC IOVΛIA ΔOMNA, laureate bust of Caracalla right, seen from front and draped bust of Julia Domna left, vis-à-vis . Reverse: VΠA KVNTIΛIANOV MAPKIANOΠOΛITΩ-N, Tyche Soteiros (Fortuna Redux) standing left, holding rudder in outstretched right hand and cornucopiae in left; E in upper left field.